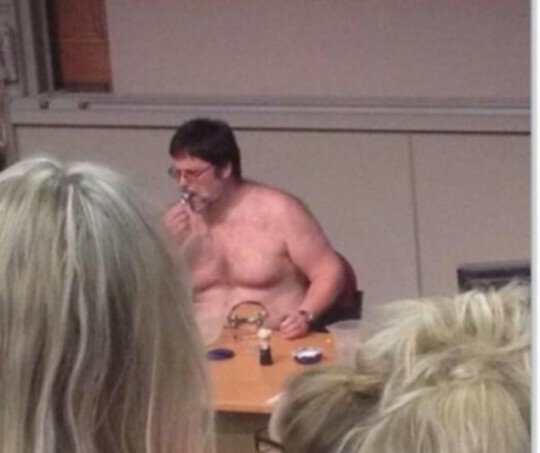 The Leeds Met lecturer who stunned his class by STRIPPING to his underwear has been let off with a warning by university bosses. Dr Ian Lamond, 51, an Events Management lecturer, made the news earlier this month after he performed a bizarre striptease in an attempt to motivate his class of 200 students. Draping his jacket over the front desks, Dr Lamond removed his shirt and tie before swirling his trousers around his head, apparently in an attempt to teach students how to give an exciting sales pitch. However, the university weren’t buying what the good doctor was selling and so, after pictures of the half-naked lecturer appeared online and in the press, the university announced they would be investigating the matter. Leeds Met University have now released a statement, saying: “An internal investigation has taken place. The University has clarified its expectations in lecture delivery and so the matter is now closed”. @KatieSanders9 Ian Lamond is stripping and shaving to try and convey a point but I really have no clue what is going on! The incident, which occurred in April, produced a flurry of tweets from confused students, tweeting pictures of the 51-year-old wearing nothing but glasses, socks, and grey underpants. I literally have no idea what is going on right now, why is my lecturer semi naked.. and now painting his face white..
“This episode brings higher education into disrepute. It illustrates an arrogant contempt for students; many of whom make sacrifices to attend university and incur considerable debt. “Equally worrying is that Leeds Metropolitan University has recently had its standards and quality confirmed by “The Quality Assurance Agency for Higher Education (QAA).